During the month of March, the URI Young Leaders Program focused on activities for caring for the environment, sharing information about initiatives and ideas about what young people could do in their communities and individually. 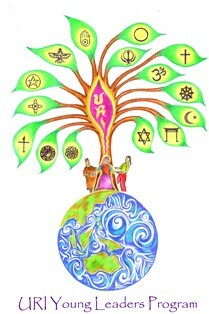 A live online chat on this topic was also held on this topic through the Young Leaders Communications Hub on March 29th in which youth from 5 countries participated from Catholic, Jewish, Brahma Kumaris, Hindu and Christian Scientist traditions. You can read the transcript of this chat by clicking here. Find out how to join this month's live chat below in the section on Taking the Initiative. The URI President's Council is now forming an Environmental Satellite to explore how URI can both locally and globally strengthen its commitment to caring for the Earth, and several of our young leaders have been invited to help shape this vision. We are proud to share the following articles from our young leaders about action projects they are organizing in their communities, as well as a report from the field about youth participation in the recent URI Southeast Asia and the Pacific Assembly whose theme was: Building Teamwork and Strengthening Leadership in the SEAP Region. "A first in the history of the SEAPac region, the youth were present in great numbers, and had a promising role to play, last March 16-21, 2008 in the 5th Regional Assembly. The SEAPac CC leaders and Trustees gathered in the humble town of Tubod, Lanao del Norte, Mindanao to bridge leadership and strengthen relationships across the region. The youth, who comprised over a quarter of the participation of the regional assembly and were first timers can be likened to little rose buds, small petals still in its early stages beginning to form an effervescent rose that gives beauty to all. Gratefully receiving social and spiritual guidance, brimming with passion and idealism, the youth see their role as a responsibility, challenge, and opportunity in rising and extending the vision of URI. The responsibility in continuing the dialogue and peace-building work depends on the youth, and such is the challenge that the youth face. In bringing more people, regardless of age, or level of wisdom and experience to the fore, and in the many choices we face, the opportunities for the youths are endless! “Trailblazing” was a word used to describe the youth’s participation in the regional assembly, as the youth played a very pivotal part in the regional meeting. We were also greatly inspired by a memorable meeting with Gov. Khalid Quibranza-Dimaporo, the governor of Lanao del Norte - the youngest governor of the Philippines, of only 28 years. He is a shining exemplar of a youth leader who has taken a keen role in Interfaith and Peacebuilding Dialogue! From coming up with witty energizers, such as a URI clap, to helping coordinate the program and also organizing a very organic and nourishing mandala activity, the youths were very much engaged and a part of the week! The youths continued to enliven the spirit of the participants, by organizing two very successful Film Screenings of the various work being done by the CCs around the region, and of the local efforts to lessen the plight of the strained Muslim-Christian relations in Mindanao. However, just like a rose that is in the midst of thorns, several thorns or obstacles stand in the way of the rosebuds reaching full bloom. A hindrance to the youth’s participation could be the language barrier and the fact that resources such as time and energy are limited. These physical thorns coupled with the emotional ones of relating with people from different backgrounds are the two types of impediments encountered along the way of reaching full bloom. But the tools of trainings and other resource mobilization techniques, continue to provide opportunities for growth to develop the skills of other youths and for the region. And just as a flower needs water and nutrients to grow, the wisdom and guidance provided by our elders will continue to mentor us as we go through this path. They say that, where flowers bloom, so does hope. It is therefore fortunate that the seeds have been planted and the rosebuds have been formed so as to create a garden of peace in the world we live in." *Sharon Vaswani is the Youth Coordinator of the URI South East Asia and the Pacific Region. She also sits in the steering committee of the URI Young Leaders Program. She is active in both her local interfaith group, Y4U: Youth for Unity, and the URI Global Youth CC. We are excited to report on the collaborative and collective action projects URI Young Leaders are organizing around the world. This month, we are proud to feature an inspiring environmental project that is being developed by young leaders in Uganda and is building cross-regional collaboration, a bridge-builders project in Argentina, and the celebration of the International Women's Day in the UK. Our commitment and greater efforts have been directed towards conservation by identifying alternative and more efficient technologies from Solar Cookers International. Solar cookers are efficient cooking devices that use heat from the sun to cook food and pasteurize water for drinking and are very efficient in Uganda because it shines everywhere. 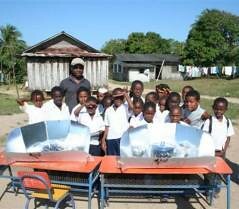 Solar cooking addresses many issues linked to poverty in the developing world because 90% of all food staples must be cooked before being eaten yet fuel for cooking is inadequate because of excessive deforestation leading to desertification. Deforestation is a world-wide problem. In Africa people cook this way and are affected by deforestation and respiratory diseases. Most people in Africa rely on wood, charcoal, dung and crop residues as traditional biomass. 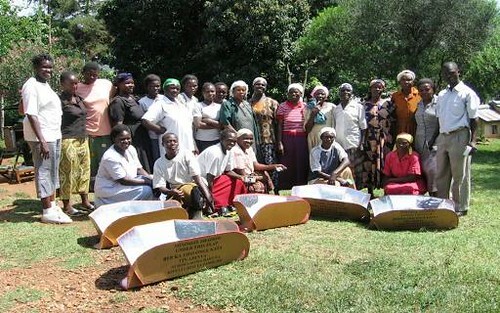 Environmental awareness and education resources developed by Solar Cookers International across the Great Lakes Region thus enabling collaboration efforts with humanitarian organizations that offer relief to refugees in the region. Our fundraising efforts to help women and children in refugee camps have so far yielded 102 dollars from Sande Harte of S.A.R.A.H. CC. Many thanks to Sande Harte and the team at Sarah cc for their generous support. We look forward to giving you more action information as we move to help people in refugee camps and Internally Displaced People's camps in Eastern Uganda. Regards to all, Hannington wako, URI Uganda." 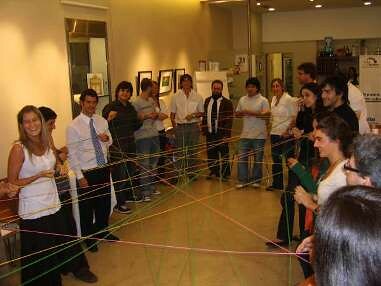 "The Embassy of the United States of America, Public Affairs Section, Buenos Aires, made an award to United Religions Initiative, Fundación Judaica and Fundación de la Amistad Argentina Turca to create a multi-faceted initiative targeting university-age students, ages 18 to 30 years old, from the local Muslim, Jewish, and Christian communities. The project connects these diverse young adults religiously and spiritually, creating constructive relationships of understanding and trust and empowering the audience to plan, engage, and sustain interfaith action locally, nationally, and globally. Participants learn the practical skills, tools, and models necessary to promote cultures of dialogue, peace, and understanding, diminish tensions created by lack of knowledge and fear of the unknown, and meet a network of likeminded individuals with whom to partner. The program, 'Constructores de Puentes' (Bridge Builders) is already in its first phase of development. This is a preparatory stage in which the participants, fifty young Muslim, Jewish, Christian men and women, study the values, cultures, rituals, beliefs and other aspects of the three religious traditions. They will visit places of worship and study material from the different communities.At the end of May these young adults will divide in teams of three to six students from the different religions to design and implement joint community service programs, reflecting and promoting the values and understanding learned in the preparatory stage supported by experienced mentors. Students will also attend a three day fellowship camp to deepen relations, build trust, inspire future initiatives, and celebrate their participation in the project. It is expected that by the end of the year, these young leaders will be ready to design their own initiatives and train other young people without the aid of mentors, thereby becoming a multiplying force for peace and understanding." For more information, contact: Maria Eugenia Crespo de Mafia, mcrespo@uri.org. Maria is the URI's CC Global Support Coordinator. "Women and Men from different backgrounds came together in Huddersfield in an event to celebrate the achievements of women globally and to mark a very special event. They held a half-hour silence outside Huddersfield Library before setting off on a ‘peace walk’ to the Hindu temple on Zetland Street to share food and talk about their own personal experiences and shared stories of heroines from their faiths. It was part of International Women’s Day which was started 100 years ago as a political event to recognise the struggle for gender equality. 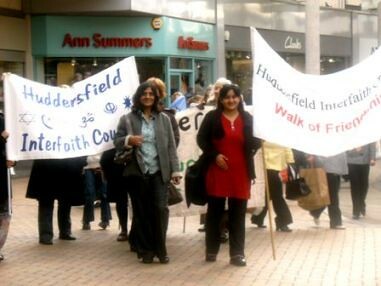 Kiran Bali, Vice Chairman of Huddersfield Interfaith Council, said: 'As women of faith and of no faith, we gathered to learn from each other, explore values and concerns and to stand united.' There’s no room for complacency because, although there have been considerable achievements, women continue to experience inequity. Mr Gurdev Singh Gossal of Faith 2 Faith CC said this was a truly inspiring event where people of all backgrounds came together and learned from each other." In honor of this month's World Health Day, our Taking the Initiative focus for April is on health and healing. We invite young people to organize projects or discussion in your communities around the issues of health care, and explore the role that faith plays in healing and health. Join our LIVE ONLINE CHAT to share your ideas with other young leaders from around the world about what people of faith are doing to care for each other and the sick. This month's live chat will be on Sunday, April 26th, at 14:00 GMT / UTC. You can read the transcript of the last live chat on "Faith and the Environment" here. Details about how to participate in this live chat can be found at the Young Leaders Hub at www.ga08youth.com. stalcott@uri.org for inclusion in our next newsletter! - URI Interfaith Youth Leadership Retreat, San Francisco, CA, USA, June 12-14, Anubhuti Retreat Center, USA, www.ga08youth.com/events.aspx. For more information, contact: Sarah Talcott, URI Youth Programs Director,stalcott@uri.org Phone: 1-415-561-2300. After hours Coffee House where coffee, entertainment, fun and networking will be on the menu. 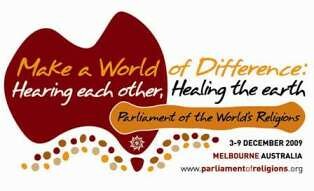 Imagine young people from all corners of the globe, from all kinds of faith traditions, with so many different stories to share, all together in one place for seven days. This will be the 2009 Parliament experience! On behalf of the Young Leaders Program Steering Committee, I thank you all for your support and participation in building the interfaith youth movement!